Apple is set to close its last remaining pop-up shop dedicated to Apple Watch next month. Signs displayed at the Tokyo shop, located in Shinjuku’s high-end Isetan department store, were shared on Twitter announcing the closure. 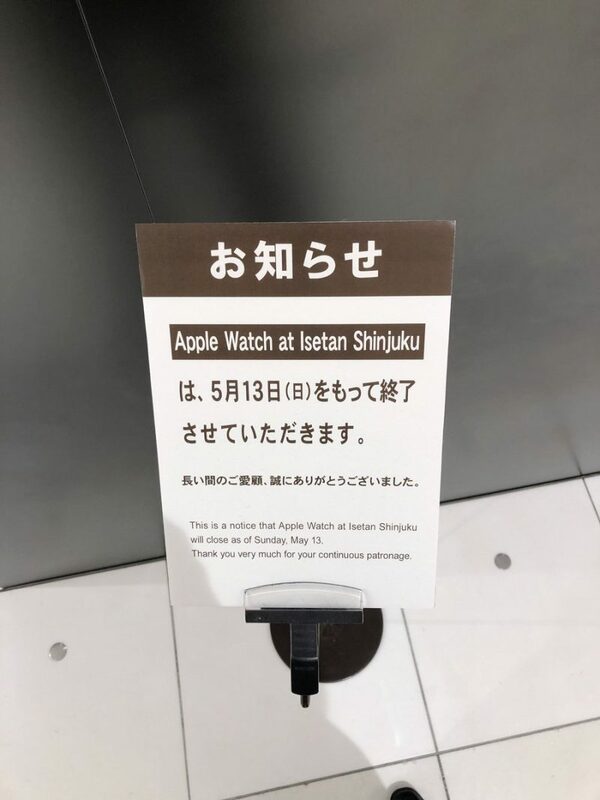 The closure of the pop-up shop follows last month’s opening of Apple’s Shinjuku store, which is situated directly opposite Isetan and offers the full range of Apple products and services, including Apple Watch. Japan’s pop-up shop is notable for being the first of its kind to open, coinciding with the launch of the original Apple Watch in 2015. Apple has only operated three pop-up shops worldwide selling Apple watches and bands. The other two operated out of Galeries Lafayette in Paris and Selfridges in London. Both closed in 2017. The closures appear to be part of Apple’s strategy to promote Apple Watch as a health and fitness accessory first and a haute couture fashion detail second. The pop-up shops specialized in selling Apple Watch Edition models, gold versions of which sold for at least $10,000 and up to $17,000 when they hit the market. The pop-up shops were essentially outlets for Apple’s remaining inventory of 18-karat Gold and Rose Gold Apple Watch Edition models, which were discontinued in 2016 and replaced with the ceramic Edition models the company continues to offer online and in-store to this day. Are You Sure that Employee Wants a Promotion?